For a writer, drafting a story is all about putting all the thoughts down on paper (or virtual paper) as fast as possible. Often, if not always, this comes at a price. Drafts are messy. They often make us cringe when we read them. Why? For many reasons, but one of them is because we use words that are always the same boring ones, which most of the times break one of the sacred rules of writing: show, don’t tell. One such word is ANGRY. Below is a small list (more words to follow in the coming weeks) of synonyms that we can use instead. 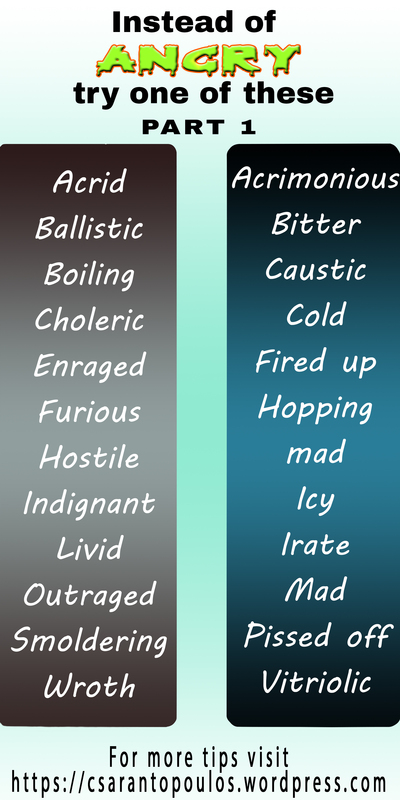 As is always the case with synonyms, each word carries a unique inherent meaning, so even though each is a synonym to angry, they don’t always serve as a replacement. Make sure you’re absolutely certain that the word you’re about to use carries the meaning you have in mind. This entry was posted in Advice and tagged advice, angry, creative writing, critique, editing, edits, fiction, novel problems, novel writing, revisions, synonyms, writing advice, writing problems, writing tips. Bookmark the permalink.